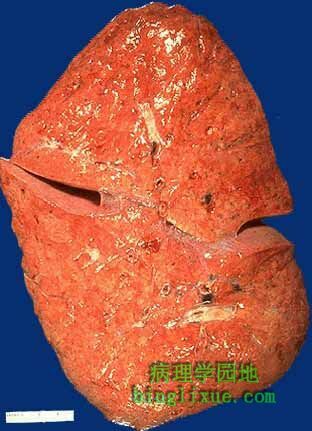 This lung is as solid as liver because of Pneumocystis carinii pneumonia (PCP). There is diffuse consolidation. PCP is typical of immunocompromised patients, particularly those with AIDS. 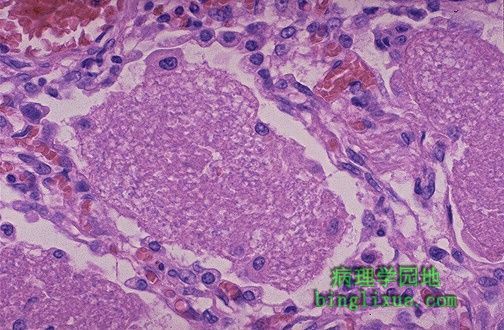 At higher magnification, the cut surface of the lung with Pneumo- cystis carinii pneumonia (PCP) has a salmon pink appearance. Microscopically, every alveolus is filled with granular pink exudate in this case of Pneumocystis carinii pneumonia. 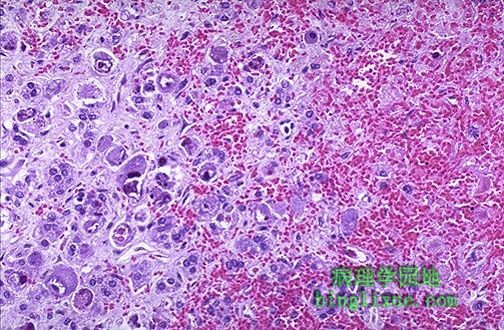 At higher magnification, the granular pink exudate of Pneumocystis carinii pneumonia is seen. 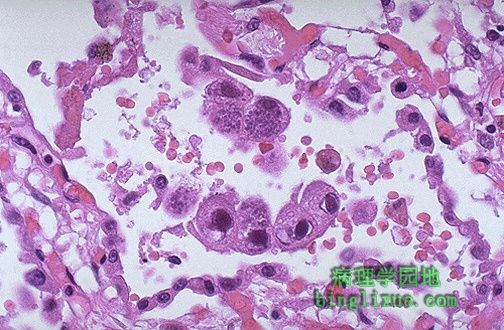 The exudate consists of edema fluid, protein, Pneumocystis organisms, and dead macrophages. One can see why gas exchange is severely compromised. 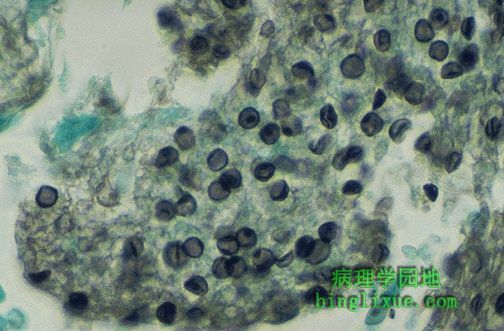 This is cytomegalovirus (CMV) infection in the lung. Note the very large cells that have large violet intranuclear inclusions with a small clear halo. Basophilic stippling can be seen in the cytoplasm. 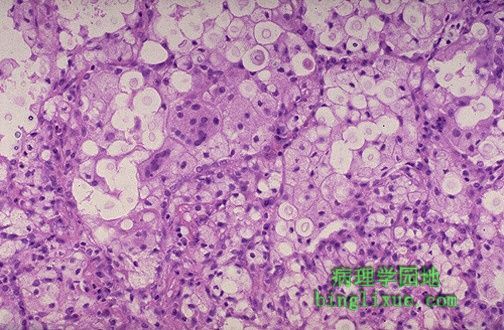 Many cytomegalovirus inclusions are seen in this adrenal, which has necrosis and hemorrhage as well at the right. 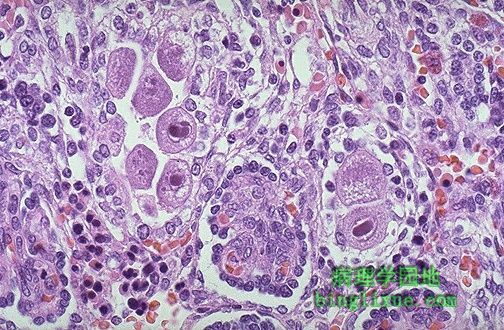 CMV is usually seen in immunocompromised hosts and can be widespread in many organs. Here is a congenital cytomegalovirus infection in a fetus. 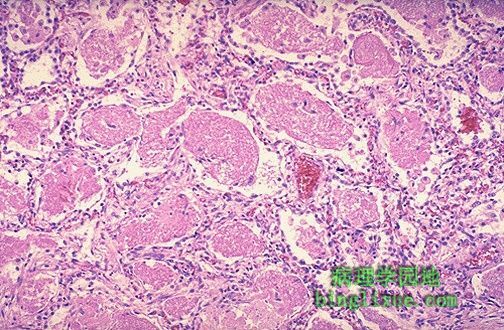 Note the large CMV inclusions in the renal tubular epithelium. 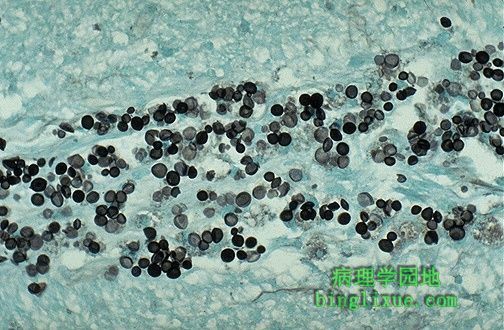 This is Cryptococcus neoformans infection of the lung. 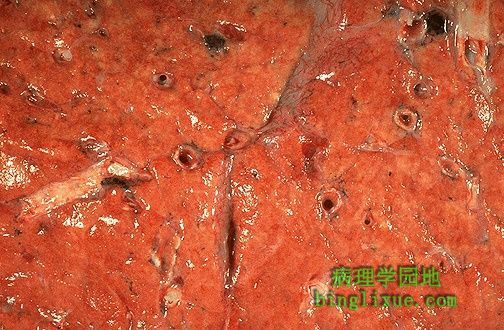 There are numerous organisms that have a large mucoid capsule, giving the appearance of a clear zone around a faint round nucleus. This is a Cryptococcus neoformans meningitis stained with GMS to reveal the nuclei. In this AIDS patient, the organisms didn't even bother to make a capsule. The budding cells of Cryptococcus have a narrow base.